The epic conclusion to 2016’s Rogue One was bold, tragic and yet incredibly satisfying. One might call killing off each and everyone of the rebels introduced to in the Star Wars spinoff a brutal ending, but it added new depth and emotion to A New Hope and showed the stakes of the series’ conflict more than ever before. However, the scene that sticks in our minds of most when we think Rogue One wasn’t initially in the backbone of the script. Wait? Does this mean Jyn and Cassian were going to originally tie the knot at the end of Rogue One? Chris Weitz doesn’t specify, but what could have been certainly doesn’t top the perfect finale we got in the 2016 spinoff. Looks like the writers’ early draft was aimed to please the Disney brand, but wasn’t doing service to the story to be told. If the writers didn’t kill off the cast of Rogue One, fans would have certainly wondered why they were never mentioned in the Star Wars franchise starting with A New Hope. In the movie, they are able to send out the weakness of the Death Star to the Rebellion right before their demise, allowing for Luke Skywalker’s heroic journey to still make sense and feel untouched. So, the end of Rogue One just had to end the way it did and without it, the movie would not have been so highly regarded by fans. Thanks to positive reception of Rogue One, the series is getting a spinoff of its own for the studio’s upcoming streaming platform Disney+. 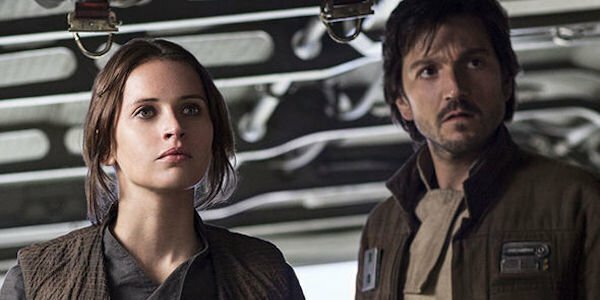 The Rogue One television series will by a spy thriller starring Diego Luna’s Cassian Andor, taking place before the events of the 2016 movie. The developing series has The Americans writer and executive producer Stephen Schiff signed on as the showrunner. Disney+ has a Star Wars series titled The Mandalorian from Jon Favreau coming to the platform when it launches later this year. The Skywalker saga is also set to conclude when Star Wars: Episode IX hits theaters on December 20, 2019.